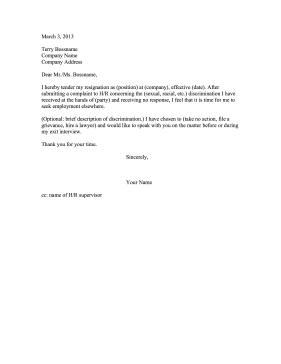 If prejudice or discrimination is at work in the workplace, this resignation letter can outline the details leading to the employee's departure. I hereby tender my resignation as (position) at (company), effective (date). After submitting a complaint to H/R concerning the (sexual, racial, etc.) discrimination I have received at the hands of (party) and receiving no response, I feel that it is time for me to seek employment elsewhere. (Optional: brief description of discrimination.) I have chosen to (take no action, file a grievance, hire a lawyer) and would like to speak with you on the matter before or during my exit interview.